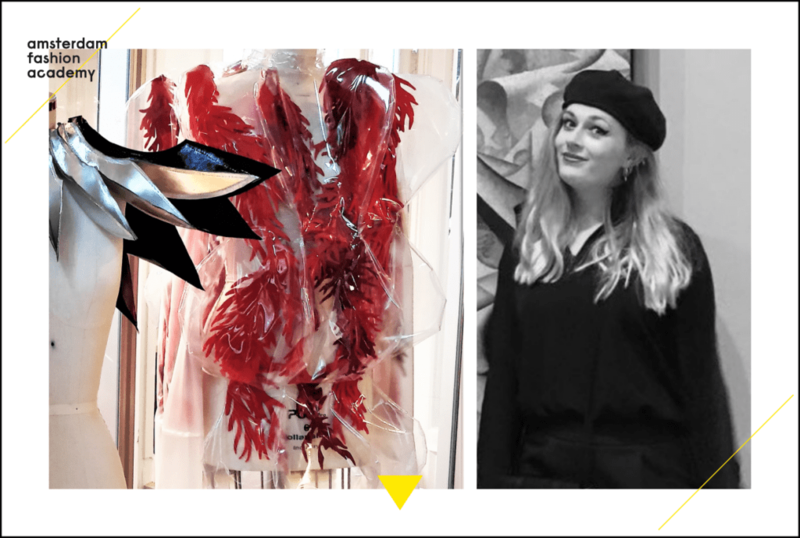 The 2nd year Fashion with Textiles Design (Hons) BA students are busy creating garments as part of the course Fashion Cutting & Construction, under the expert instruction of senior lecturer Cristiano Carciani. The theme is “top view” meaning they need to design and create garments as seen from above. 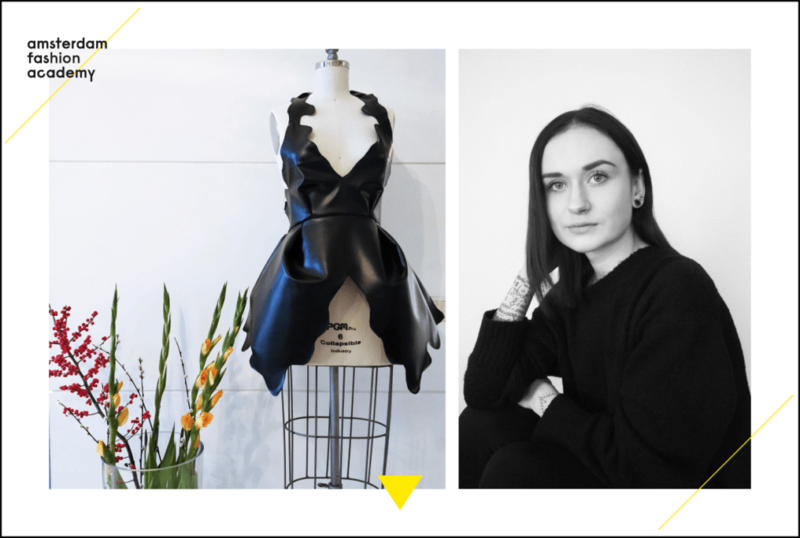 We asked Myrthe van der Leden, Evelina Anglickaite, Silvia Porru and Alexandra Poláková to tell us more. Evelina Anglickaite: “To some it’s a dangerous pseudoscience, to others it offers unique insights. The Rorschach psychological test consists of inkblots challenging a person’s perception. The piece, inspired by the controversial test and made from leather, showcases strong individual minds”. Silvia Porru: “This project is all about shapes, forms, geometry and chrome colours. I wanted to express these elements giving a three-dimensional effect to my garment. Inspired by the universe and the stars, I have created a spacey, star-shaped collar”. 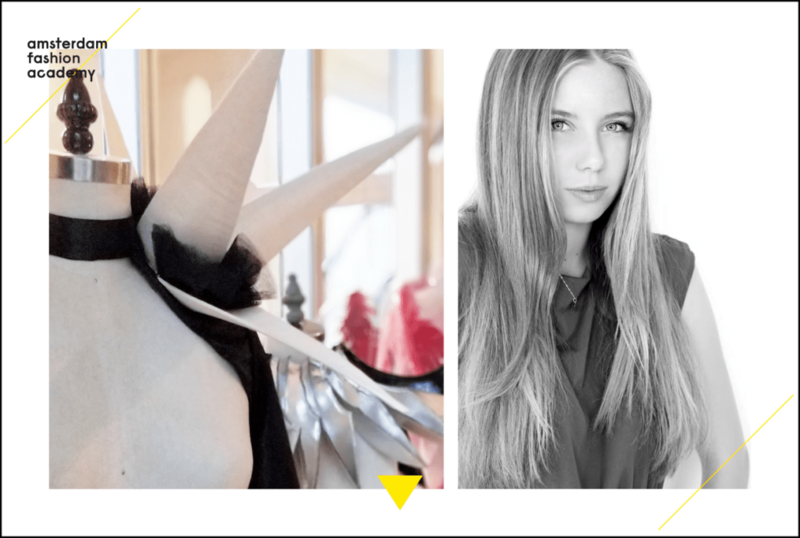 Alexandra Poláková: “The most important part of the garment are the three-dimensional spikes placed on the shoulder. When the final garment will be completed, these elements will design a black hole when seen from above. I’m enjoying working on this piece, because it gives the opportunity to balance details and simplicity”. 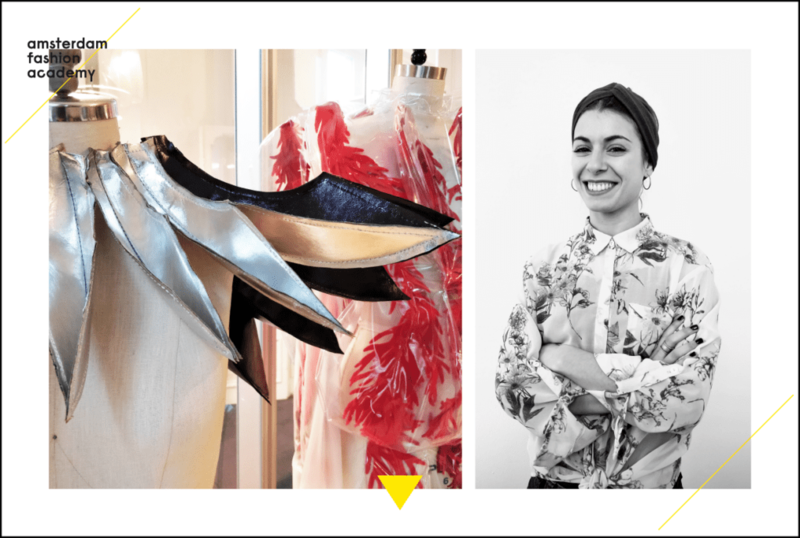 The Fashion with Textiles Design (Hons) BA offers a nurturing environment where you our students develop industry standard skills in both fashion and textiles. The course is taught through a series of practical project assignments, with key emphasis on quality of products and innovative design. The practical modules are delivered through a variety of workshops, demonstrations, lectures and seminars, but the most important aspect of this programme is that each student becomes an individual designer. Thanks to our small classes and commitment we can achieve this together by providing each individual student with one to one tuition time every week. At the Amsterdam Fashion Academy we pride ourselves on our commitment to our students. We recognise that giving each student substantial personal support is key to helping them get the most out of the course and themselves and help them successfully enter into the international world of fashion and textiles. Would you like to study at our international boutique academy in Amsterdam and create garments like these? Then sign up to one of our open days and we will be happy to schedule for you a personal meeting with us.